Mysterious crop circles have been reported as far back as the 1600s. Modern theories at that time usually attributed the overnight creation of these elaborate geometric symbols as the handiwork of the Devil and his various minions. It wasnt until 1978 that the world got its first real introduction to whats become the ongoing crop circle phenomena. While out harvesting, a wheat farmer from Hampshire, England found a swirling 20 meter wide circle pressed into the middle of his ripening grain field. Minutes later he found four smaller circles spaced evenly around the large one. While it seemed reasonable that some kind of precise and crushing force had created these five circles, closer inspection revealed that not a single stalk of downed wheat was broken or even damaged. Nor were there any tracks by vehicles or strangers leading to or away from the formation. The incident received minimal media attention and after a few days the baffled farmer decided hed been the victim of some elaborate hoax. The discovery of crop circles rose dramatically between 1980-1990. In 1990 over 400 circles were reported in England alone. Other countries like Australia, Canada, South America, Europe and the United States also began seeing their fair share. Fields of barley, oats, canola, wheat, and sometimes even wide expanses of snow, were being decorated with bigger and increasingly elaborate patterns. These ranged from simple circles to designs that mimicked ancient hieroglyphs found on the Egyptian pyramids. Still others took on the shapes of fish, insects or complex mathematical models related to fractal geometry. Two of the most elaborate designs in this sudden crop circle outbreak were found in very close proximity to Stonehenge. But it wasnt just their sophisticated design that baffled crop circle enthusiasts and scientists alike. These circles, have not only left patterns on the ground, but physical changes to the plants and ground. The stalks of the crops are not broken, they are bent. Bent so severely, under microscopic analyzation, the grain has actually been bent and intertwined at a molecular level. Not only have they been bent, but there have been trace amounts of radiation found in the plants themselves along with the surrounding soil. Had this been from hoaxers, I see no way possible to intertwine them so perfectly and radiate them. The most burning questions on everyones mind was, who was making these ingenious patterns - and why? Some scientists attribute the formation of crop circles to natural forces like violent weather, or rarer meteorological events like stationary whirlwinds. These are sudden bursts of air that sink to the ground and flatten crops very quickly and in a spiral formation. Other experts from the United States blamed the formation of crop circles on the increasing use of circular irrigation. This form of irrigation leeches salt from the soil, thus making crops weaker and much more susceptible to strong winds. Numerous other theories abound from the bizarre to the impossible: farm machinery gone amok, crop diseases, insect and bird infestations, overuse of chemicals, earthquakes, witchcraft, radio frequencies, secret military testing -- the list goes on. A cable television network even set out to prove once and for all that two men working all night could create an elaborate geometric shape by doing nothing more than following a fields ley lines, walking softly, and using simple tools -- a few boards and a sturdy rope. Doug and Dave claimed to be the culprits of the entire crop circle phenomenon experienced in England. This is impossible due to the sheer numbers recorded. 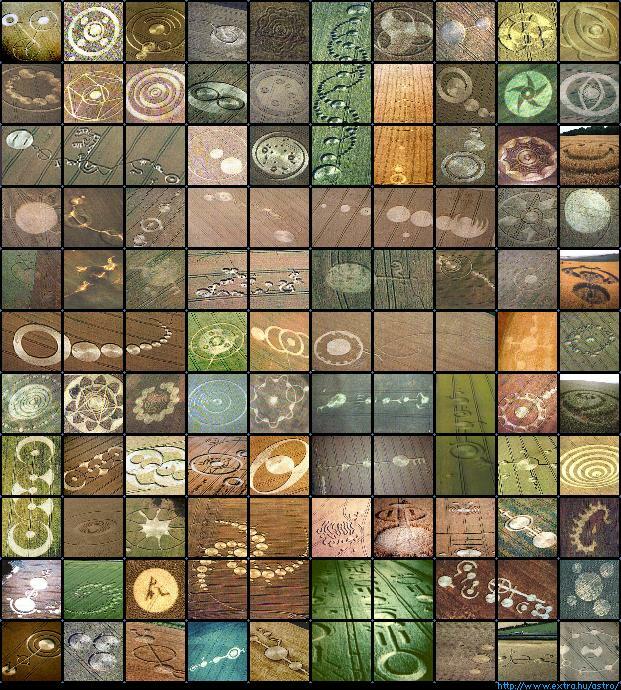 By far the most popular and favored theory is that crop circles are messages or contacts left by UFOs or aliens visitors. Who these aliens are, why they leave such intricate messages and what they mean are yet to be unraveled. What is known is that hours before crop circles are discovered there are always increased reports of UFO sightings in the area. Although there are many theories regarding their origin, serious scientific inquiry - both government and private - agree that within the circles, electromagnetic and ionic properties of the plants, the soil, and the cellular structure of the plants are measurably different from their surroundings. Physical changes of plants and soil - not only does the physical appearance of seem to change (it looks dehydrated), but there is change at the molecular level. Research has been conducted over a ten year period with samples and thorough laboratory testing carried out by the biophysicist Dr. Levengood, Nancy Talbott, and John Burks -- the BLT Research Team, and a small army of volunteers worldwide. Their findings include enlarged cell walls, expulsion cavities in the nodes of the plant stalks, significantly extended node lengths, and changes to the soil composition from samples taken within the crop formations in contrast to the control samples taken from outside the circles. that plants within a formation actually bend at the naturally occuring nodes 90 degrees. This can also happen in hoaxed formations where the plant is pressed to the ground and "bends" to reach towards the light. This process known as phototropism is more pronounced in younger stalks, often reaching up towards the light in 1-2 days. However, what isn't well-known is that there is more than one possible place for bent nodes. Some formations have had stalks all bent from the same node. Some formations show bending at the knuckle closest to the ground, yet in a neighboring section they all bend two knuckles up and so on. In the line of ~24 circles in Windmill Hill in 2000, virtually all the stalks were bent 1/4" beneath the nodes, though at completely different heights (1" to 6" range) from the ground. This means that each stalk would have to be bent individually to give that effect.